There are many options now for independent musicians to sell their recorded works online today. Some of the more successful options include the large mp3 selling store itunes, and media giant amazon. As some would think that those are the only two mp3 selling outlets worth while, others have brought a different game to the table. Amie Street, an indie online music store and social network, is doing just that. 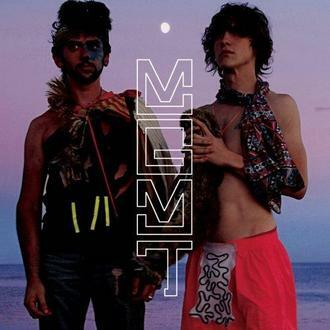 With just a few years under their belt, they have managed to acquire a large music catalog featuring a variety of indie music acts including the likes of MGMT, The Black Crows, and Third Eye Blind. Striking deals with prominent labels such as Nettwerk Music group, United For Opportunity, INgrooves, and Daptone Records, Amie street strives to provide a full filling music search of independent music for a diverse crowd of users. Amie Street operates in a very different way that has not been mimicked to date. A cool thing about this system is that your songs are first available for free when you post them. After your popularity goes up, so does the prices of your songs. As an artist you upload your mp3's to be down-loadable by the users of the site and when users buy your music you get credited with quarterly checks. So after each song has reached $5 in sales, the artist receives 70% of the sales proceeds after that, with a price range based on your songs popularity. 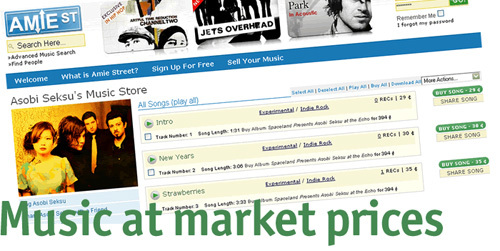 Albums are priced at the current total cost for each individual song on the album, and usually capped at $8.98 in most cases. As well artist are not required to sell their music exclusively through Amie Street encouraging artist to maximize their exposure. When searching for new music, I find the Amie street approach to artist promotion quite lacking. If I find a new artist that I am interested in, I generally would like to know more about them. So when I go to an artist page, the only information available to me is their song tracks for sale and the name, genre, and record label of the band. No description, no bio, no incite whatsoever to who these people are. As well there are no options for artists to link to any of their other sites for further music promotion. So really for the artist, the only thing you can do for your band on Amie Street is upload your music to be downloaded for free and hope you tracks will become popular to maybe earn a little side income from mp3 sales. The fact that you have to go to another site on your own accord to find out any descriptive information about the artist seems restrictive and not very user friendly to the artist and fan. As well their claim to be a music social network is a farce and quite noticeably no where to be found. The fact remains that there are more superior sites to purchase mp3's and physical merchandise with a better interface and platform. Some to consider would be Think Indie, Shock Hound, and CD baby. Happy hunting!